On November 17, 2015, Catherine, Duchess of Cambridge attends the Fostering Excellence Awards at BMA House in London. The Duchess selected a dress for the evening by Indian designer SALONI. 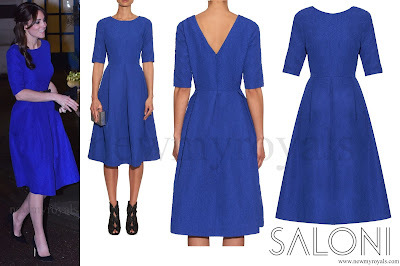 The Martine Crinkle-Effect Dress is crafted from lightweight fabric, round neck and v-neck back in cobalt blue. The Martine Crinkle Effect Dress retails for £462 on the "MATCHESFASHION" website.